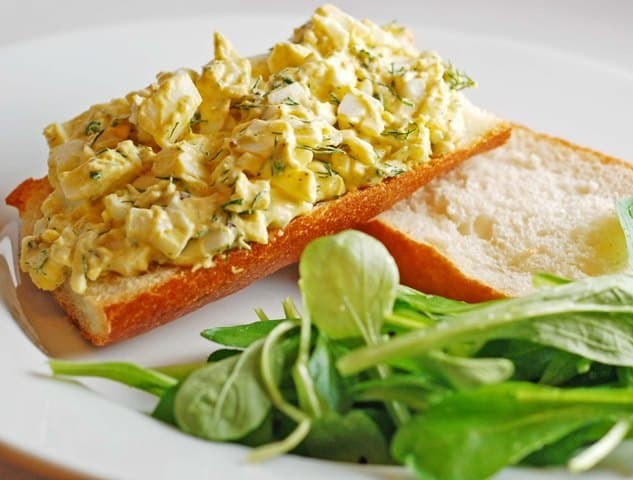 Some of the feedback that I heard from many of you was about wanting to see some healthy lunch recipes for kids, so the one that I want to share today is my so tasty it’s too good to be true Egg Salad Recipe. By simply reducing the mayo and amount of egg yolks that are in traditional egg salad recipes, and adding in some extra flavor, I transformed this typically fattening dish that is not only low in WW Points for you, but healthy and delicious for your kids. Serve it up over a bed of fresh greens, fresh tomato slices, or as my 2-yr old likes it – over mini whole grain toast slices. The entire recipe is just 4 Points!! Do you realize that this means you can sit down and eat the WHOLE bowl and not feel an ounce of guilt? Yeah, I’m loving that aspect. Enjoy! A quick and healthy kids lunch idea or Weight Watchers Lunch Idea, this low calorie egg salad recipe is not only delicious, but easy to make. Full of protein, low on fat and carbs, it’s just 4 Points for the entire recipe! Mash egg and egg white in a small bowl with a fork. Stir in celery, mayonnaise, mustard, onions, dill, lemon juice and salt and pepper until combined. Absolutely! Feel free to use the light mayo if you prefer. Some people don't like the taste of the light mayo (myself included), so I use the Greek yogurt, but using the light mayo instead shouldn't change the nutritional stats enough to affect the Points Plus value. I can't wait to make this recipe! Thank you. I have another variation of Egg salad. Chop the egg whites, thaw the spinach, toss in large bowl with mayo and mix till blended. Entire recipe is 7 points+! Can add salt and pepper to taste. I havent tried replacing Greek yogurt for some of the mayo I'm sure that would taste great too. Would it still have the same consistency if I dont use lemon? I hate lemon :( It sounds very good! Yes, it may be a tad bit thicker, but it won't affect the overall recipe that much. If you prefer, you can use a 1/2 tsp of apple cider vinegar instead. Thanks for reading!